What Is It Like When One of Your Parents Gets Alzheimer's? What Is It Like When One of Your Parents Gets Alzheimer’s? I knew right away that something was different. My 74-year-old mother and I had been very close all my life. (She lives with my family.) When her personality started to change, I couldn’t understand why. She loved crafts, gardening, singing, piano, anything creative, but all of a sudden she wasn’t interested in her hobbies. She just wanted to sit in her chair and watch TV. We started to argue. It reminded me of when I was a teenager 25 years earlier, how we would squabble over stupid things. Now she would get angry at the littlest thing and slam her bedroom door in my face. Nothing made sense, why was she changing? Was she mad at me? Was she depressed? Should I take her to a doctor? One day she would be grumpy and then the next she would seem fine and we would go shopping for flowers, have a great lunch out, and come home laughing. Cook a ham, play some Scrabble, help the kids with homework, she was an integral part of the family. I kept thinking … oh good, it’s over now. But then a week later, her alternate personality would come back. Irritable, argumentative, slamming her hand on the table, frustrated, insisting that she was right even though everyone in the family knew she was wrong. Another day would pass and she would have no memory of having been angry or why. It was very frustrating. She would be her normal self and expect others to treat her normal. But we were still angry from the fights the day before and didn’t want to just forget and have everything be as if it never happened, again and again. We were walking on eggshells trying not to provoke her, yet once it happened and the “real her” was revealed once again, all bets were off. The screaming was cathartic after awhile. The past and everything I had ever done wrong was a good source of ammunition for her. Then the real memory problems started. She would forget that you can’t put a metal spoon in the microwave. When I brought it up she would insist that she hadn’t done it. Another fight would ensue. We would be driving home and she wouldn’t know what street we were on. She would stay up all night long and sleep all day and didn’t know if it was day or night when she woke up. She would lock herself in her room and watch infomercials. Before I knew it packages were arriving in the mail: Hundreds of dollars were being spent on work at home schemes and worthless coins. I didn’t know what to do. She insisted that she was going to do work-at-home jobs, but I noticed that all of sudden she was making mistakes in her checkbook, having trouble reading. Even if she could do these jobs, they were a scam, but she didn’t see it. She accused me of trying to circumvent her freedom. We went to see the doctor. I told him of the changes that had been taking place. I mentioned Alzheimer’s. He laughed at me, made me feel like a fool. He asked her who the president was, what the date was, a couple of other innocuous questions, and then told her three words that he wanted her to remember. A couple of minutes later, he asked her the three words. She could only remember one of them. He patted her like a puppy said everything was all right, told me that she was fine, and sent us on our merry way. She was vindicated. See! Told you there is nothing wrong with me! If I knew then what I know now I would have sued the jerk. I wish I had taken her to a specialist and not a general practitioner. Live and learn. Things continued to worsen, but the pace was so slow that it was hard to tell on a monthly basis. It was only by looking back a year or so that I could see all of the changes in her that had been made. She was starting to have trouble walking. Afraid that she was going to fall. Next was the incontinence. But she refused to wear a diaper, so for months I had loads and loads of pee-soaked laundry to do on a daily basis. I had to cover all of the couches and chairs in crib liners. I am still embarrassed to have company over to the house. Sometimes the smell is just horrible. She would ask the same questions over and over. What time is it? What day is it? Where is the baby? How many cats do we have? What time is it? How long have we lived here? Where is my food? I haven’t eaten in two days! I started a diary of inappropriate and mean things that she said. I would show it to her a day later but she would deny having said them. All I wanted was for her to acknowledge that she was becoming intolerable and understand where we were coming from. To hear a little old lady swear like a Navy sailor was scary. How can she not remember?? I realized that taking videos would become important. I am so glad I have them now, although they are hard to watch. When I would play back the audio tape of her voice she would be shocked and apologetic. We would talk about it. It didn’t matter, though. It would only last a half-hour before she forgot again. I realized that it was me who wanted her acknowledgement, that it was pointless to her. Once I realized that, I quit trying to get her to admit that she was different now. Years continued to pass and she slowly changed from the mother I knew to someone I didn’t know and didn’t want to know. She stopped taking showers and cleaning her dentures. She refused to cut her hair. She insisted that she had never seen the clothing that she wore each day. She argued incessantly with my children, especially the youngest, who didn’t know that a 6-year-old and a 77-year-old shouldn’t be battling over how to play card games. She demanded candy and cookies and would refuse to eat anything else. The warm loving mother and grandmother turned into an evil witch. The kids grew to hate her and refused to help her or be friendly to her when her mood would swing back the other way, and I could see the confused hurt on her face when they would ignore her. I didn’t know what to do. I read as many books as I could about Alzheimer’s. But they were all about who the people used to be instead of the changes they were going through. Why was it such a mystery? It was like if you weren’t a member of the club you had no idea what it was like. I joined a support group and tried to help the other members learn how to deal with their family members. One man was frustrated because his wife wanted to purchase 12 cans of corn at the grocery store. He tried and tried to convince her that they had some at home. She became hostile. I told him, buy the corn. Later in the week when she forgets about it, take it back for a refund. The point is to stop the fighting and agree with the patient, whatever they believe, just agree, agree. No point in arguing. The patient is on another plane. Living in an alternate universe. Never to return. The easiest way to cope is to think of them as a child. A child regressing backwards. A child that can’t remember what a beautiful person they used to be. I thought about medication, but reading about the side effects, the vomiting, the liver problems, I had doubts. When I learned that the medication didn’t actually slow the progression of the disease, I decided to forgo the pills. Looking back, I probably should have tried them. Just perhaps to have her be like her old self for a longer period of time. It went in stages. There was the season when she wanted to watch The Pianist every single day. It was always as if she had never seen it before. Then she wanted to write her life story. Except what she wrote was wrong. She thought she was born where her mother was born. She forgot marriages, children, and jobs. There were the three months in the hospital getting over pneumonia. I would visit her and she would ignore me, preferring to watch the TV. Then the next day she would ask why I hadn’t come to visit her in a week. It was heartbreaking. Once she was back home, it was as if it had never happened. She didn’t even realize that she was now in a different bedroom, closer to the bathroom and kitchen. There were small moments of kindness. We would take her to her favorite restaurant for her birthday. I gave her a gorgeous music box that she loved. We all hugged and smiled and took pictures and she went on and on about how wonderful the food was and how much she loved us etc. I would be on cloud nine. A couple of days later, back at home there was another argument. She picked up this music box that she didn’t recognize and threw it at the television. Beyond the destruction and mess my heart was bleeding. I brought up her birthday dinner to try and break through the haze of hostility. She yelled that she hadn’t been allowed out of the house for something good to eat for months! The knife goes deeper. I pick up the music box and place it on the piano. I can’t listen to the tinkling song: “My Favorite Things” from our favorite musical that we used to sing together. There came a point when I really started to wonder if the new her was the real her that had been hiding deep inside all these years. What if that wonderful person, so good at hugging and taking care of boo-boos and listening to my woes was all fake? What if this creature was really the mother I never knew? All of my school friends use to say she was the coolest mother on the block. I have so many memories of talking and sharing, painting walls, building 3-D puzzles. I started to get hurt so many times each day that to protect myself I told myself she was dead. She was dead to me. Finally, I mourned and realized that my mother was gone and I never even got to say goodbye. After several years, we finally got into a routine. She was OK with wearing diapers, although sometimes she would only change it once a day or take it off and not put on a new one. When I tried to change it for her a fight would start. She would swear that she had just changed it or that it was dry etc … It got to the point where I was afraid to ask her. I really didn’t need the stress. Then there were the fights over medication. Every night I would tell her it was time for her pills, but she would insist that she had already taken them. I would show her that they were still in the days-of-the-week box, but she didn’t know what day it was. She would accuse me of trying to poison her. We stamped the calendar with a happy face for taking them and an unhappy face for refusing them. Several weeks would pass and she would swear that she had taken them on all of the days with the unhappy faces. Eventually I just gave up. I’m the caretaker, but she refuses to let me take care of her. It’s been nine years now. A very slow progression. The anger is mostly gone now. Every day she sits on the couch and says to my son, “I didn’t know you could play the piano so good, when did you learn that?” Every day he smiles because she asked the same exact question of him the day before. Her short term memory is completely gone. She will ask for dinner and then be completely surprised when I hand her food five minutes later. “How did you know I was hungry?” She will watch a movie and say “I used to live there!” even though it was 60 years ago. Watching her listen to music from the ‘40s and ‘50s is strange. She knows every single word and laughs so brightly as she sings along. Sometimes she thinks I am her mother, which makes her cry since she lost her mother at age 16. I hug her and tell her how proud I am of her, what a good girl she is. She can no longer remember the names of my children or husband. It’s “the tall one” the “brown-haired one” and “the baby,” who is 13. Family members from far away have stopped calling. She seems a bit more like her normal self, friendly, complimentary, yet there has been so much sludge under the bridge the past decade that family members have a hard time even smiling at her or answering about how their day was. I’ve been trying to tell the family, she has changed again, this is a new person again, please hug her, hold her hand, smile at her jokes. But they are leery. They know it is only a stage, and it is better for one’s heart to keep it locked. When she had her CT, the doctor said that her brain had shrunk quite a bit. He said as portions go dormant she will regress and then other portions of the brain will pick up the slack and she will come back until those connections stop too. I try to take advantage every time she seems to have made some new connections. It’s nice to hear her ask “Why can’t I remember?” when years ago she wouldn’t admit that for anything. 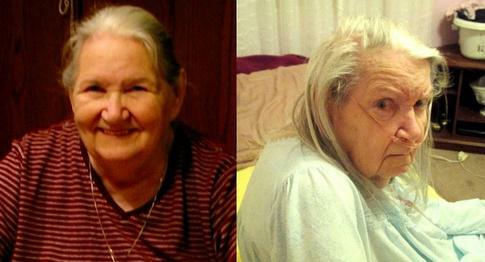 The author’s mother, before and after the ravages of dementia. I’ve been dreading the end for years. We just found out that she has inoperable lung cancer and will be gone within the year. I am SO relieved. Now she can have hospice, and I feel like I will have a little bit of control. I am glad that she has no idea about the cancer (she forgets when we mention it), which is a blessing. I am grateful that my children will not have to remember how awful the end was going to be, and that the ending via cancer should be much more humane. I know the next year is going to be horrible for me. There will come a time when she can no longer walk without slumping like a rag doll. She already has trouble chewing her food. Swallowing pills is out of the question. She no longer can make it to the bathroom or the kitchen. She calls on me constantly. I haven’t been this sleep deprived since my children were babies. I will only keep the first picture after it is over. She was so loving, so giving, I would have done anything for her. Even take care of her until her last day. What should I do if I think my father is in an early stage of Alzheimer’s Disease?